The LGBT Aging Project - Programs & Support Groups | Fenway Health: Health Care Is A Right, Not A Privilege. The LGBT Aging Project – Programs & Support Groups | Fenway Health: Health Care Is A Right, Not A Privilege. 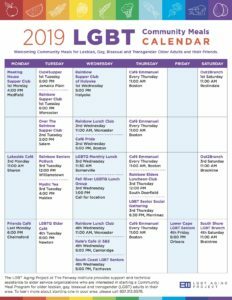 The LGBT Aging Project – Programs & Support Groups – Fenway Health: Health Care Is A Right, Not A Privilege. We are pleased to have a whole section dedicated to the different LGBT Community Meal Programs that are starting to emerge across the state. We now have a nice variety of offerings from weekly luncheons, monthly brunches, a monthly women’s program and two monthly supper programs. There is also a nice diversity in the location for each of the ten programs. CLICK ON THE BELOW IMAGE TO DOWNLOAD THE FULL MEAL PROGRAM CALENDAR (PDF). The LGBT Bereavement Support Group is the first statewide initiative to address loss in the LGBT community. The program is funded by the Department of Public Health and it is facilitated by Ethos, an elder service agency in Jamaica Plain and The LGBT Aging Project. This initiative consists of six free LGBT Bereavement Groups each in different parts of the state. Each group will run for six consecutive weeks and will be led by a licensed clinical social worker who specializes in bereavement issues in the LGBT Community. The free group is open to any lesbian, gay, bisexual or transgender individuals who have experienced the loss of a loved one (family member, friend, partner/spouse). Current bereavement groups include General Loss, for LGBT adults of any age who are experiencing the loss of a loved one (partner/spouse, friend, parent, family member, etc.). Are you in need of an LGBT Bereavement Group in your area? The LGBT Bereavement Groups are funded by the Mass Department of Public Health and facilitated by Ethos and The LGBT Aging Project, a Program of Fenway Health. All groups are free and run for 8 weeks. All groups require pre-registration. For more information on the LGBT Bereavement Program contact Bob Linscott at 857.313.6578 or blinscott@lgbtagingproject.org. We are proud to be a founding member of the National Resource Center on LGBT Aging. Recipient of The Cummings Foundation 100K for 100 Non Profits.